Check Out Ford F-150 Raptor Design Features | Texstar Ford Lincoln Inc.
Are you in the market for an off-road pickup truck? The Ford Raptor is a sought after off-road truck that comes with exceptional features. Here at Texstar Ford Lincoln Inc., our team likes to keep our customers informed about updates with our models. Check out the Raptor's design features below. 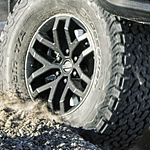 The Raptor offers available beadlock-capable wheels. These wheels were designed to enable drivers to air down the tires for enhanced traction on off-excursions. You can also choose the available BoxLink system that includes a stow-able loading raps, an integrated tailgate step with lift assist, LED box lights, and remote tailgate release. The class-exclusive box steps are deployable and available on every cab configuration. The Raptor has a military-grade, aluminum-alloy body and a fully boxed high-strength steel frame. While the body is strong, it doesn't weigh the truck down, which is why the Raptor gets impressive payload and tow ratings. The strong and rigid frame is also lighter by up to 60 pounds.